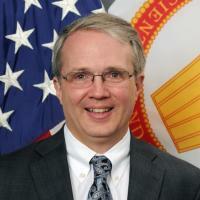 Research Description: Dr. Everitt is one of the Army's chief scientists. He works at the Army's Aviation and Missile RD&E Center at Redstone Arsenal, AL. Through his adjunct appointment in the Duke Physics Department, he leads an active experimental research group in condensed matter physics, nanophotonics, molecular physics, and novel terahertz imaging with colleagues on campus and through an international network of collaborators. Four principal research areas are being pursued: 1) Ultrafast Spectroscopy. This effort concentrates on the ultrafast spectroscopic characterization of wide bandgap semiconductor heterostructures and nanostructures. We use independently tunable pump and probe wavelengths that span the ultraviolet-visible-infrared regions from 200 nm to 12 microns with pulses shorter than 150 fs. The objective is to mapout and control carrier, exciton, and phonon transport and relaxation pathways in metal oxide and III-N semiconductors, sometimes doped with rare-earth atoms, using quantum efficiency, cw and time-resolved photoluminescence and differential transmission measurements. Areas of recent interest include characterization of efficient phosphorescence in sulfur-doped ZnO, carrier dynamics in III-N epilayers and multiple quantum wells, and characterization of radiative and nonradiative recombination of rare earth dopants in wide bandgap semiconductor hosts. 2) Ultraviolet Nanoplasmonics. Using metal nanoparticles to concentrate electromagnetic fields locally is an area of active research, most of which concentrates on using Au or Ag in the visible or near infrared spectral regions. Neither metal works in the ultraviolet, but there are significant advantages of extending plasmonics into the ultraviolet, including enhanced Raman cross sections, accelerated photo-degradation of toxins, and accelerated excitonic recombination. In partnership with Profs. April Brown (Duke ECE), Naomi Halas (Rice Univ. ), Fernando Moreno (Univ. Cantabria), and others, we have been identifying and exploring new nanostructured metals including gallium and aluminum for ultraviolet plasmonics. We have recently demonstrated accelerated emission rates and surface enhanced Raman spectra in the ultraviolet. 3) Molecular Physics. The longest research effort involves the use of molecular rotational spectroscopy and time-resolved techniques to investigate molecular collision dynamics. These studies will help us develop more efficient terahertz sources, detect and identify clouds of trace gases, and understand nonequilibrium atmospheres and interstellar media. In collaboration with Prof. Frank De Lucia of Ohio State Univ., Dr. Everitt was the first to map out the complete rotational and vibrational energy transfer map of methyl fluoride, leading to the demonstration of a compact, tunable, coherent source of terahertz radiation for use in ground-based spectroscopy and astronomical observation. This double resonance technique has now been adapted as a new means for remotely identifying the constituents of a trace gas cloud at distances up to 1 km. 4) Terahertz Imaging. This newest activity uses powerful, cw, tunable millimeter- and submillimeter-wave sources to adapt various coherent imaging techniques to the terahertz spectral region. Interferometry, digital holography, tomography, synthetic aperture RADAR, ISAR, ellipsometry, and polarimetry are all explored to develop practical tools for non-destructive measurements of visually opaque materials. The lab contains a unique combination of tunable sources, Schottky diode detectors, heterodyne receivers, and bolometers, plus a one-of-a-kind THz beam characterization and imaging instrument. The lab also explores ways of optimizing and accelerating these slow imaging methodologies using digital reconstruction and compressive sampling techniques pioneered by on-campus collaborator Prof. David Brady and novel beam forming metamaterials with Prof. David Smith. Li, X; Zhang, X; Everitt, HO; Liu, J, Light-Induced Thermal Gradients in Ruthenium Catalysts Significantly Enhance Ammonia Production., Nano Letters, vol. 19 no. 3 (March, 2019), pp. 1706-1711 [doi] [abs]. Kriisa, A; Samaraweera, RL; Heimbeck, MS; Everitt, HO; Reichl, C; Wegscheider, W; Mani, RG, Cyclotron resonance in the high mobility GaAs/AlGaAs 2D electron system over the microwave, mm-wave, and terahertz- bands., Scientific Reports, vol. 9 no. 1 (February, 2019), pp. 2409 [doi] [abs]. Everitt, HO; Tyler, T; Caraway, BD; Bingham, CM; Llopis, A; Heimbeck, MS; Padilla, WJ; Smith, DR; Jokerst, NM, Strain Sensing with Metamaterial Composites, Advanced Optical Materials (January, 2019) [doi] [abs]. Swearer, DF; Gottheim, S; Simmons, JG; Phillips, DJ; Kale, MJ; McClain, MJ; Christopher, P; Halas, NJ; Everitt, HO, Monitoring Chemical Reactions with Terahertz Rotational Spectroscopy, Acs Photonics, vol. 5 no. 8 (August, 2018), pp. 3097-3106, American Chemical Society (ACS) [doi] [abs]. Wang, F; Lee, J; Phillips, DJ; Holliday, SG; Chua, S-L; Bravo-Abad, J; Joannopoulos, JD; Soljačić, M; Johnson, SG; Everitt, HO, A high-efficiency regime for gas-phase terahertz lasers., Proceedings of the National Academy of Sciences of the United States of America, vol. 115 no. 26 (June, 2018), pp. 6614-6619 [doi] [abs]. Dr. Everitt is one of the Army's chief scientists. He works at the Army's Aviation and Missile RD&E Center at Redstone Arsenal, AL. Through his adjunct appointment in the Duke Physics Department, he leads an active experimental research group in condensed matter physics, nanophotonics, molecular physics, and novel terahertz imaging with colleagues on campus and through an international network of collaborators. Four principal research areas are being pursued: 1) Ultrafast Spectroscopy. This effort concentrates on the ultrafast spectroscopic characterization of wide bandgap semiconductor heterostructures and nanostructures. We use independently tunable pump and probe wavelengths that span the ultraviolet-visible-infrared regions from 200 nm to 12 microns with pulses shorter than 150 fs. The objective is to mapout and control carrier, exciton, and phonon transport and relaxation pathways in metal oxide and III-N semiconductors, sometimes doped with rare-earth atoms, using quantum efficiency, cw and time-resolved photoluminescence and differential transmission measurements. Areas of recent interest include characterization of efficient phosphorescence in sulfur-doped ZnO, carrier dynamics in III-N epilayers and multiple quantum wells, and characterization of radiative and nonradiative recombination of rare earth dopants in wide bandgap semiconductor hosts. 2) Ultraviolet Nanoplasmonics. Using metal nanoparticles to concentrate electromagnetic fields locally is an area of active research, most of which concentrates on using Au or Ag in the visible or near infrared spectral regions. Neither metal works in the ultraviolet, but there are significant advantages of extending plasmonics into the ultraviolet, including enhanced Raman cross sections, accelerated photo-degradation of toxins, and accelerated excitonic recombination. In partnership with Profs. April Brown (Duke ECE), Naomi Halas (Rice Univ. ), Fernando Moreno (Univ. Cantabria), and others, we have been identifying and exploring new nanostructured metals including gallium and aluminum for ultraviolet plasmonics. We have recently demonstrated accelerated emission rates and surface enhanced Raman spectra in the ultraviolet. 3) Molecular Physics. The longest research effort involves the use of molecular rotational spectroscopy and time-resolved techniques to investigate molecular collision dynamics. These studies will help us develop more efficient terahertz sources, detect and identify clouds of trace gases, and understand nonequilibrium atmospheres and interstellar media. In collaboration with Prof. Frank De Lucia of Ohio State Univ., Dr. Everitt was the first to map out the complete rotational and vibrational energy transfer map of methyl fluoride, leading to the demonstration of a compact, tunable, coherent source of terahertz radiation for use in ground-based spectroscopy and astronomical observation. This double resonance technique has now been adapted as a new means for remotely identifying the constituents of a trace gas cloud at distances up to 1 km. 4) Terahertz Imaging. This newest activity uses powerful, cw, tunable millimeter- and submillimeter-wave sources to adapt various coherent imaging techniques to the terahertz spectral region. Interferometry, digital holography, tomography, synthetic aperture RADAR, ISAR, ellipsometry, and polarimetry are all explored to develop practical tools for non-destructive measurements of visually opaque materials. The lab contains a unique combination of tunable sources, Schottky diode detectors, heterodyne receivers, and bolometers, plus a one-of-a-kind THz beam characterization and imaging instrument. The lab also explores ways of optimizing and accelerating these slow imaging methodologies using digital reconstruction and compressive sampling techniques pioneered by on-campus collaborator Prof. David Brady and novel beam forming metamaterials with Prof. David Smith.